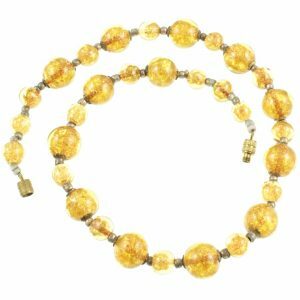 Murano glass jewellery has been produced since the 13th century. Originally produced in Venice but due to a fear of fire in Venice, the Hierarchy decided to move the factories to the island of Murano. 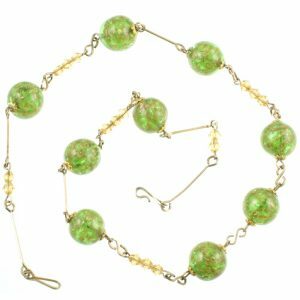 This glass jewellery is also commonly known as Venetian glass Jewellery. The skills of glassblowing originated in the East, Egypt, and Syria. By integrating eastern skills with that of the Murano Master craftsmen, they created a unique product. Venetian glassmakers in this early period were not allowed to leave Venice or give anyone the secrets of glassmaking in order to prevent the skills leaving Venice. The punishment was a prison sentence, there was also a carrot in the form of elevated positions in society and financial remuneration. The artisans were kept in splendid isolation to maintain the secrecy of the art. In the 15th century and the 16th century, Murano glass became very popular. Innovative products were produced to a highly skilled degree. These new products became highly favoured. Clear glass for windows, tableware and mirrors for the wealthy houses of Europe. Enameled glass was also in demand with a highly decorative effect. Lattimo glass is opaque white glass which imitated porcelain from China. Which was very expensive and rare, something only the privileged could purchase. Now those with less funds could imitate the great houses with the Murano Lattimo. These innovations maintained the prosperity of Murano glass for two centuries. In the 17th century the glassblowing industry was in decline. It was a silent decline, this was partly due to the release of knowledge into Europe of the glass production methods. Coupled with the black plague, which reduced the workforce and innovations of leaded glass outside of Murano in Bohemia and Ireland. The Murano industry was maintained in this period by trade between the west and the new world. As silks and spices were purchased with boatloads of glass beads from Murano. By the 18th century, the factories were in full declined and eventually closed. Venetian political power also declined. At the end of the 19th century and the beginning of the 20th century with the arts and crafts movement and the emergence of art nouveau styles. Murano glass jewellery became very popular again. The 1895 biennial exhibition in New York of new works profiled Avante Garde designs and showed the new styles. Some of the artisans of Murano adapted their skills to the styles whereby they flourished again. In the 1920’s and 1930’s the Art deco style emerged and changed the landscape, by introducing a simpler approach to design. Clean lines where glass became an element of interior design rather than the focus. In this period a trend for animals and clowns made of Murano coloured glass became popular. They also created tableware with intricate internal design and clear glass outside. During World War 2 the industry declined again but afterwards adapted to the new minimalist/functional style. Murano glass has a very long tradition of highly skilled glass production with a very proud history, which has survived through dedication and an ability to adapt skills to the needs and wants of their market. The glass jewellery made by the artisans of Murano is the most delicate and intricate of Murano glass, where beads have been created for hundreds of years. They were produced in vast quantities in the 17th century in order to trade with the new continents for spices and other goods. Coloured glass was created from basic clear Murano glass by adding mineral oxides and chemical derivatives. These colours were very intense and were of a wide range along the colour spectrum. Glass techniques: Murine technique also known as Millefiori involves layering of coloured liquid glass stretched into long rods known as cones. When these are cold they can be sliced into cross sections which made individual beads known as millefiori “thousand flowers” produced in a similar way as the seaside rock candy. These can be of different sizes, colours and designs. Fillegree glass was invented in Murano by Filippo and Bernardo Catani of the glass house Serena in 1526. It is the process of layering random components in layers of crystal giving a three-dimensional effect. The same technique has been used in Murano for hundreds of years. Enamelling Is the use of molten metal liquid to coat the glass beads in order to give them a luscious effect. This high gloss effect appealed to the sophisticated population of Europe at this time. 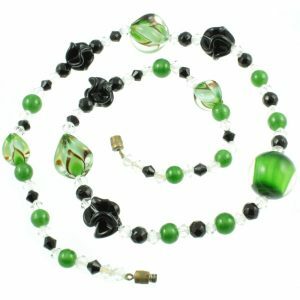 Lampworking is the most popular process used to make Murano glass jewellery. Where a wire is used to coil molten glass around it and is then individually decorated by the artisan under a heat lamp placing different components in the bead and intertwining it with different colours, when the glass bead is finished it is placed in a tray to cool, it slips off the wire when cooled leaving a hole for threading called ‘perleri’. 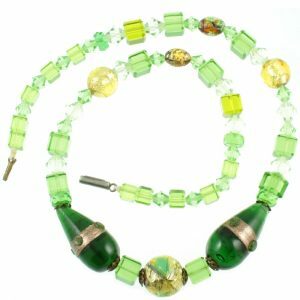 These are the best known of the Murano glass jewellery and are very time consuming to produce. 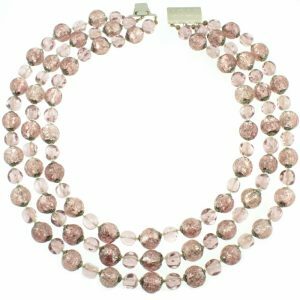 The most stunning of these, are the foil beads made of intertwining different colours with gold or silver foil internally in the bead, giving an exquisite finish. Wedding cake beads are also a lampworked technique using glass overlay using roses, swirls and dots. 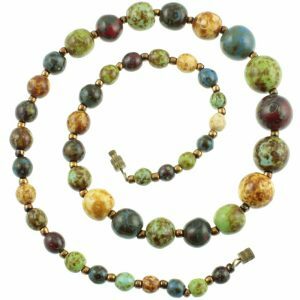 Aventurine beads are lampworked by adding ground Aventurine gemstone internally giving a delicate and interesting finish, created in the 17th century also known as star-studded beads. Chevron beads also known as Rosetta beads were first produced at the end of the 14th century. These were made with a hollow core. With six layers of glass of red white and blue in a zig-zag pattern. These are very traditional Murano beads. Seed beads are small round beads with hollow tubes of coloured glass which are then chopped and re-fired for smoothness and shade. These are very delicate, the skills of the glassworkers of Murano are a living art exhibit of a millennium of glass craftsmanship. These skills have to be preserved and used in practice to maintain the knowledge and ability of glass production and techniques of the Murano island. 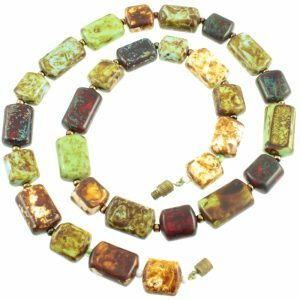 Murano glass jewellery has survived for a thousand years due to the ability of the artisans to adapt to change and develop new styles.